We are committed to enhancing The Proposal going forward to make it an even more effective and powerful sales tool for you and your business! 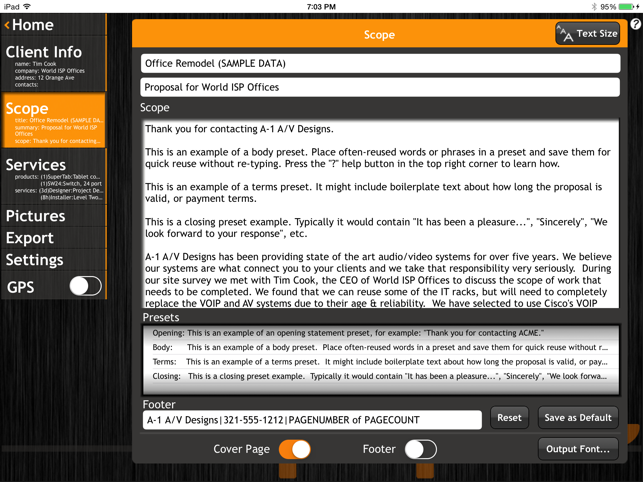 - Adjustable scope text size so you can see more of what you write. - Suitable for development of invoices, shipping lists, etc. 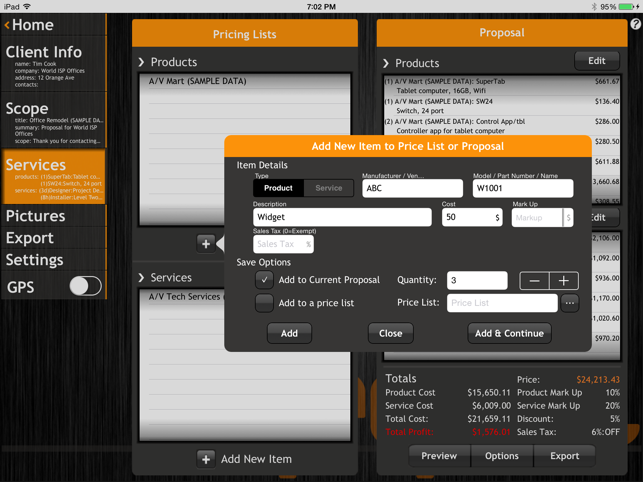 This is the first proposal app to not only include such a broad and expansive feature set, but also provide a powerful database backend to support your dealer/vendor confidential data for easy access while on-site. "You guys created THE app I have been waiting for, for a looking time! Regards from The Netherlands" - Anna M. B. "Love the app!" -Omar H.
"I am really liking the app." - Shawn W.
"I have downloaded Your app and I think it's great!" 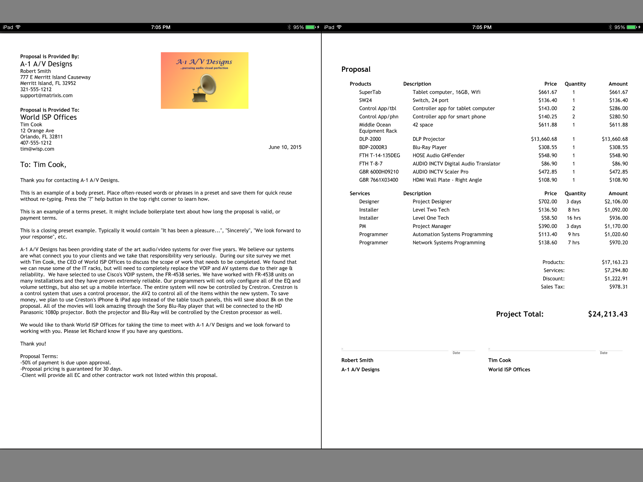 -Remco F.
NOTE: The Proposal is powerful and provides an easy means to create proposals. It is not a full-fledged word processor or spreadsheet program and does not support text formatting, page layouts, or adjusting the appearance and calculations used in price lists. The app provides an attractive and professional fixed layout along with options to enable or disable output of certain items such as a cover sheet, footer, price subtotals, and taxes, and to change the font family used in your proposals. You can also export your proposal draft to a word processor document for further refinement, for that special high-value proposal. 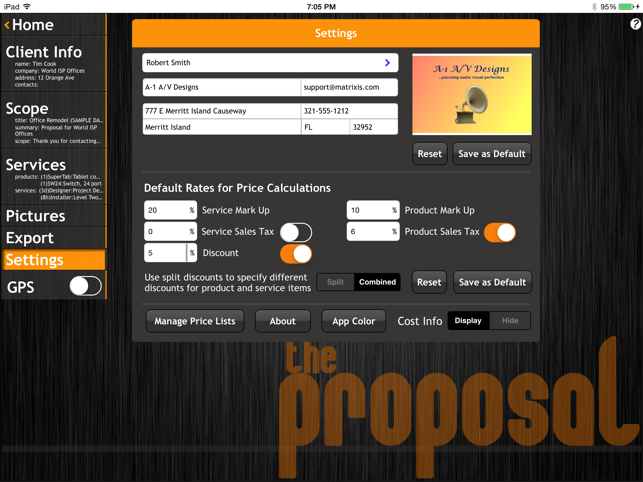 Please see a typical proposal output layout in the screen snapshots below or at http://matrixis.com/theproposalapp/. Bug fix for iOS 12: proposals were truncating bottom lines of text in price table cells (in PDFs for preview, save, or email) when using certain low-descender fonts. The proposal search function is enhanced with match highlighting. Also fixed a bug causing crash when typing fast in the search box. Relaxed import requirements for price sheets a bit, to allow “each” as a unit, and different capitalizations and plural forms of material, labor, service, product, and markup in the price sheet column headers – just to make simple errors less likely. Fixed a file selection bug: browsing subdirectories failed when opening a file. i.e. user could open a file in backups/ but not in backups/2016/ - navigating into 2016 created an error, with no way out but to cancel. Updated documentation for deleting a proposal – you must now slide the title left to display the delete button, not in either direction. Fixed an upside-down launch screen issue, which was appearing when starting the app with the iPad locked in portrait orientation. Altered database restoration behavior to begin a new backup cycle upon loading a new database. It was typically prompting to backup immediately (depending on the settings and last backup date recorded in the new database). Fixed an occasional instance of corruption of settings. We also added code to detect settings corruption and repair when found. I’ve been using this app for years and I always get compliments on how professional my proposals look. If I had one wish it would be the re-arranging my pre-sets in a different order. Awesome app, 5 stars, if I could give more stars I would. I don’t really review anything but this app has defiantly made my life easy. Once you are set up you can send out proposals in minutes. I have a medium size company and we use it daily. This app is feature rich with a ton of flexibility. The end results give you a polished and professional look. 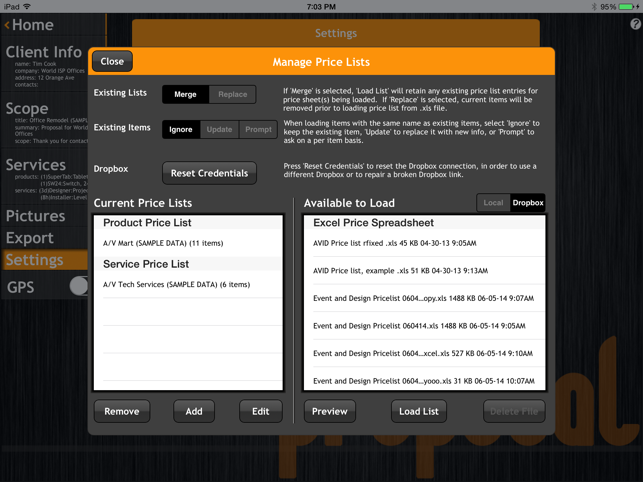 Even allows you to import excel spreadsheet pricing, include images, adjust tax, markup, discounts and so on. Too many features to list really. If you need to make adjustments to your proposal later on, it's simple and easy to do. Bottom line, if you're looking for an app with a large amount of flexible options, this is it. No more cookie cutter/fill in the blank forms that limit you or don't have features you want. This should be your only purchase. I did request an invoicing feature so that you could invoice for additional expenses at a later date without having to redo your original proposal. They said it was something that will be added in the next couple of months. And, I must say that the support for this is timely and professional which is a breath of fresh air compared to some other apps we've purchased in the past. Keep up the great work guys.